Ideally located on the prestigious Boulevard de la Croisette, this historic hotel boasts stunning views, luxury guest rooms, unique suites and the French Riviera's best shopping and entertainment just minutes away. Rooms feature fabulous art-deco inspired designs, 24 hour room service and many showcase awe inspiring views of the glistening Mediterranean Sea, just meters away. With access to a private beach, and proximity to fantastic shopping and entertainment including the famous Port of Cannes, visitors will find a myriad of activities to suit every taste. 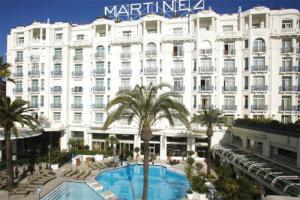 Located on the famous boulevard de La Croisette and just minutes from outstanding leisure and business facilities.